BLOGTABLE: Were ’83 Sixers most dominant playoff team ever? | NBA’s best offensive rebounder today? | What you remember most about Malone? Steve Aschburner, NBA.com: I’ll remember Moses as a man of few words, whose comments took on greater import and pithiness because he wasn’t all that talkative. I’ll remember the pools of sweat he left at both ends of every court on which he played – hardest working and most perspiring man in the game at the time. Unfortunately, though, I think I’ll remember how jarring it was to see Malone play for so many teams in his career. Legendary players aren’t supposed to pack their bags that often – even skipping his ABA stops due to that league’s shoddy finances, Malone changed NBA teams eight times. For a while it almost seemed like a Moses-of-the-month club, with Malone spread around the league so everyone could have him for a stint. Guess that makes him both old-school and very modern, as pro athletes go. Scott Howard-Cooper, NBA.com: Probably the tenacity. It seemed like if there was a rebound anywhere in the area code, he would grab it. Imagine the number of times an opponent got chewed out by their coach for not sealing Malone off the offensive boards. Coaches must have gone hoarse. Moses had good size, but he wasn’t Shaquille O’Neal or Wilt Chamberlain. But when the ball was coming off the rim, it didn’t matter. John Schuhmann, NBA.com: I don’t know if “underrated” is the right word, but looking back at Malone’s career, he clearly doesn’t get mentioned enough as one of the best big men in NBA history. When you look at his shooting numbers (49 percent for his career, only five seasons at 50 percent or better), he obviously wasn’t as efficient as Kareem Abdul-Jabbar, Wilt Chamberlain or Shaquille O’Neal. But by rebounding so many of his own misses (and that he shot free throws better than all of those guys), he kind of made up for that. Really, his numbers are right there with Shaq. 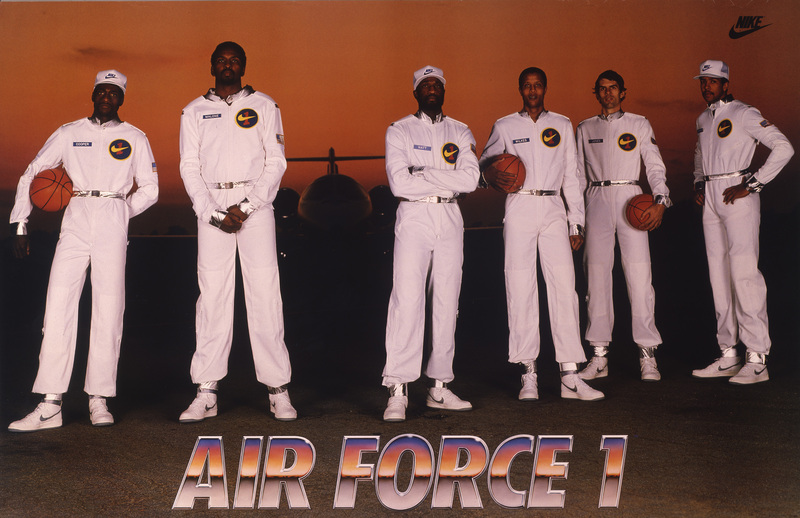 Sekou Smith, NBA.com: In addition to this Air Force 1 poster that hung on the bedroom wall when I was a kid, it’s the fact that Moses was a technician. The polish and proficiency of his game, on both ends of the floor, is what will always stick out to me about him. He dominated with what would classify now as an “old school” style that didn’t rely on his physical prowess as much as it did his pure skill and ability to wear you out by beating you to all the sweet spots on the floor. You don’t score and rebound the way he did, at his size, without being an absolute technician. Ian Thomsen, NBA.com: I think about how he was underestimated when the ABA folded in 1976. In the ensuing dispersal draft Malone was chosen second by the Blazers (their first pick was Maurice Lucas) and was then unloaded to the Buffalo Braves for a first-round pick (which turned into Rick Robey). The Blazers already had Bill Walton, who would lead them to the 1976-77 championship — but that doesn’t change the fact that they and the Braves undervalued 21-year-old Malone, who was traded again for a pair of first-rounders (Wesley Cox and Micheal Ray Richardson) to the Rockets. Two years later, Malone would be the NBA’s MVP, and in 1981 he would lead the Rockets to the NBA Finals. The misunderstanding of his potential was stunning. Lang Whitaker, NBA.com’s All Ball blog: I was in middle school in 1988, when my hometown Atlanta Hawks signed a then 32-year-old Moses Malone to team him with Dominique Wilkins and Reggie Theus and give the Hawks, finally, a potent inside-out attack and make them a presumptive Eastern Conference contender. I may have only been a kid, but I knew enough about the NBA to know that these Hawks had a chance to be special, so I mowed lawns all summer and raised $205 and bought a $5 season ticket for that ’88-89 season. By then Moses wasn’t the dominant glass demon he’d been earlier in his career, but he was still effective and still worthwhile. The main thing I remember was how often he seemed to miss short shots intentionally when nobody was near him, and how through this my friends and I learned what it meant to “pad” one’s stats. Many times after games, we would hang around near the locker rooms and ask for autographs. Moses wasn’t the most enthusiastic autograph giver, but he usually made himself available eventually. One night someone asked him if he had any extra shoes he could give away, and without looking up, Moses said, “Ain’t got no shoe contract.” What made this even better was he was starring in a national Nike commercial at the time. I remember an article once referring to Moses Malone and a then teenage Hakeem Olajuwon matching up in practice in the early 80s from a coach that was there. He said that Hakeem gave Moses a tougher match up than many centers in the league at the time. There has probably never been a better offensive rebounder than Moses Malone with averages of 5 or more offensive rebounds in 10 seasons and peaking at 7.2. Quite a few bigs don’t get 7.2 defensive rebounds per game let alone offensive. I sincerely hope it doesn’t take his death for him to finally get his due credit. John Schuhmann says Moses wasn’t as effective as Abdul-Jabbar, Chamberlain or O’Neal, but he didn’t have size advantages that they had either. Shaq’s dominance was mostly down to his size and power. Wilt had the biggest height, reach and weight advantages of any player in history which are the reasons for his effectiveness. Kareem had a length advantage over most – during his prime years in the 70s particularly – one of the things that helped make his skyhook so successful is that guys couldn’t reach up enough to challenge it. I think Moses Malone is one of the too many players who does not get the recognition and credit he deserves from too many people. Fo, Fo, Fo baby…R.I.P. to the great Moses Malone!!!! I’m so glad that Ian Thomsen discussed the ABA dispersal draft. Living in Seattle at the time, when he went to Portland I thought it would make them great and was shocked when they unloaded him for virtually nothing. No one had mentioned that detail until Ian’s comments. I thought I was remembering correctly. Thanks.